“In Some Like It Hot, Monroe’s iconic position as all‑American sufferer is in play; as she sings ‘I’m Through With Love’, Sugar is despairing, but the shadowy hotel guests are dancing anyway, oblivious. Her persona contains a quality of beleaguered innocence, such that no one condemns her ‘gold-digging’, the plan being too fanciful, too unworldly to look sinister. 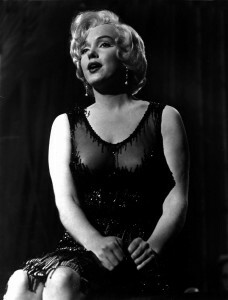 In a sense, Monroe is Some Like It Hot‘s third female impersonator. She enacts beauty as advertised. You might not want to be her, to adopt so strong a version of what the world imagined men would like. Yet her palpably fragile impersonation of the fantasy woman itself could act as an exposure of the fantasy’s essential unreality. For there was always something ostentatiously artificial about Monroe…Wilder wondered ‘whether Marilyn is a person at all or one of the greatest DuPont products ever invented.’ Often unnoticed on set, passed by on the street, Norma Jeane Mortenson could turn on being ‘Marilyn’ and in an instant claim everyone’s attention. Is Sugar coming to your town this weekend? Check here.